The presented room availability, rates and discounts are actual and final for all our 173 hotels in Wroclaw. Guests of the city will be also offered to see the panorama of the Battle of Wroclaw, which depicts one of most important historical events. The battle for independence between rebels and royal troops has claimed many lives. In 1794 rebels won the battle and Polish people are still very proud of this fact. Nowadays the spectacular panorama is decorated with various elements and an excellent lighting system, so it looks even more unusual. An excursion to the historic part of the city usually starts with visiting magnificent Tumski Bridge. This pedestrian bridge serves as a link between Old and New parts of the city. 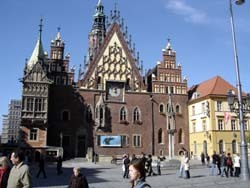 The main part of historic sights of Wroclaw is located in Tumski Island. The island is often called “the holy land" because of a huge number of religious sites and shrines located there. St. John's Cathedral is, without a doubt, one of the most beautiful buildings of the area. This is a beautiful Gothic building, which never ceases to amaze visitors with its grandeur and grace. It is believed that the cathedral was the first Gothic building constructed in the country. During the Second World War the cathedral was damaged severely, but skillful architects managed to restore it.